I constantly debate whether I should apply to an MFA program. Unfortunately the process and cost out weigh any positives. I graduated from Penn State 7 years ago. The chance a professor will write a recommendation letter is zero. Spending $30,000 dollars on my master’s degree is on par. I just can’t fathom putting myself in more debt without an absolute guarantee I won’t be paying it off until I’m 80-years-old. Schools exist, full residency, that pay the tuition for you, but you need to give something back in return. As a student, you are required to teach classes on top of your already demanding schedule. This is not what I had in mind. This does not offer the time you need to actually write when you are busy dealing with undergraduates, grading, office hours and lesson planning. Then there’s the location problem. I haven’t found any schools in my area. Moving is necessary. Can’t afford that. Oh, the school offers a stipend. Fantastic, but the stipend only covers some expenses. Once again I would have to find a job taking away time I would need to write. In my efforts of research I came across a book that promised the education of an MFA at the price of $16.99. 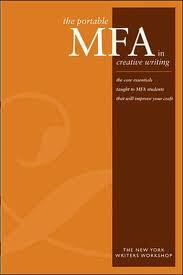 The Portable MFA in Creative Writing broke down the positives and negatives of an MFA degree. They convinced me I didn’t need to fork over all my nonexistent money to succeed. All I need to do is write and write and write. As an unemployed teacher, I have the time to write. They also point out an MFA provides a great community of writers. I have an online community through blogs, Twitter and Facebook and belong to a writers group. Taking writing classes creates more opportunities to meet more writers. Isn’t this enough? An MFA provides networking opportunities. I’ve networked through my internships. Attending conferences creates more opportunities to meet agents and other literary persons. I think I can handle networking without going back to school. One thing I’m missing at the moment is a mentor. Not entirely sure how one find one of those. Overall, I’ve concluded an MFA provides time, community and networking from the start. Given a little more time I can build a community of writers I trust on my own. Networking may not be easy, but I want it bad enough. I’ll make it happen. But the instant trust a writer gains with credentials plants doubt in my mind I will receive the same with just my work to speak for me. Do I need to get an MFA to make it as a writer?